Ah, the magic of Cyber Monday. I've been wanting to get my hands on one of these for a year now, but the $20 price tag was more than I wanted to pay for something I knew almost nothing about. But then Cyber Monday rolled around, and ThinkGeek marked it down to $5, with free shipping to boot. That price point was more palatable, so I placed an order and waited for it to arrive. And now that it's here, I'm really, really happy I didn't pay $20 for it. That feeling is the true magic of Cyber Monday. But I'm getting ahead of myself. The concept behind this is pretty fun: it's a building-block wreath intended to be used with other building blocks (i.e. 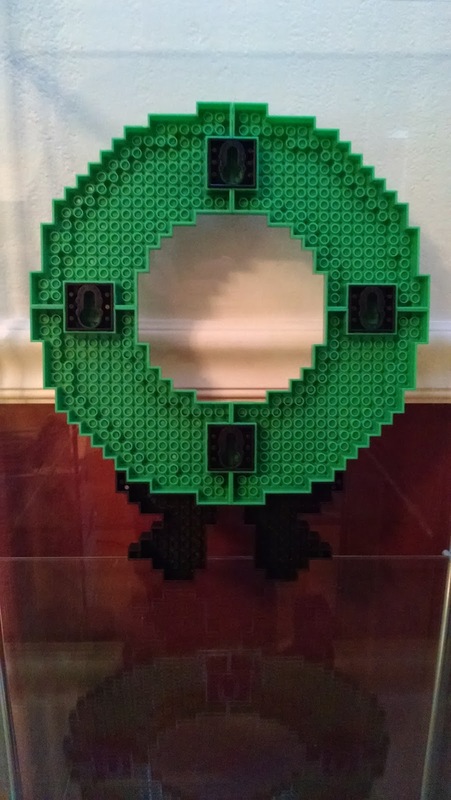 : LEGO's). 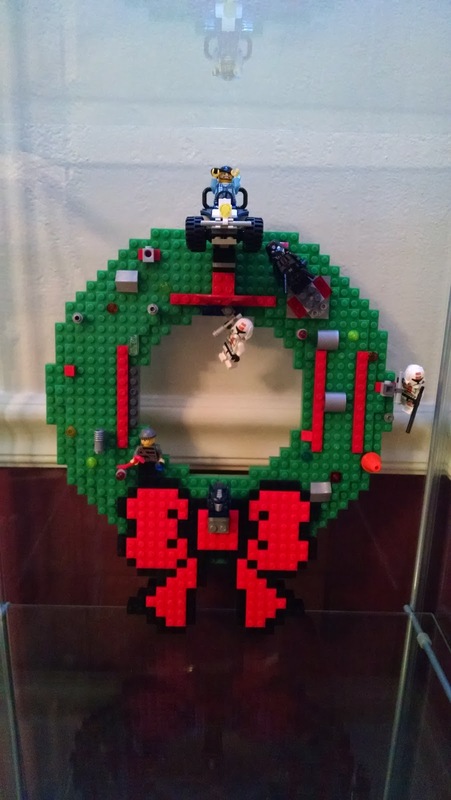 You can snap the wreath together, make LEGO decorations, and create your own masterpiece. I really had no idea what to expect from this in terms of size or complexity. 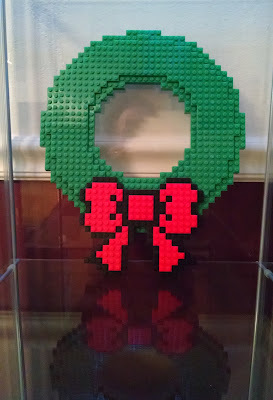 The box measures about six inches squared, but the wreath comes disassembled. Once it's complete, it has a diameter of about eleven inches (thirteen if you measure to the bottom of the bow). The box didn't contain instructions, but it was easy enough to figure out - there were only fourteen pieces total. Visually, I like the design. In particular, the bow looks really good. The whole thing has a nice 8-bit vibe that's certainly fun. But while it looks good, this is, of course, a LEGO knock-off. 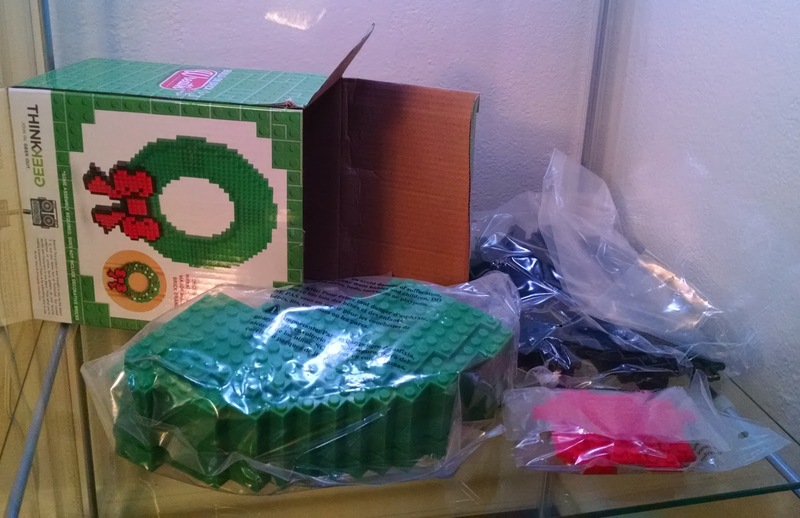 For those of you who don't have a lot of experience with Kre-O, Mega Bloks, and the dreaded Best-Lock, that means you're not getting the same quality you'd expect with the originator of the modern building block. And, in this case, it means you're getting something that isn't remotely structurally sound. Remember when I said there were fourteen pieces? That means there's really nothing locking the whole thing together, other than four bricks that go on the back. If you want this to hold at all, you're going to need bracing pieces in the front. Even then, it's going to be extremely flimsy: put too much pressure on the front and the whole thing will fall apart. That's not the end of the world. With a little patience, you can get this to work. And at $5, it's not a bad deal. But I'd feel kind of foolish if I'd paid full retail for something this shoddy. 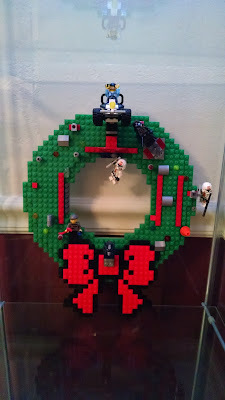 Here's a look at the wreath decked out with a handful of LEGO's and Kre-O (don't judge me - they were cheap) I tossed on. It's worth noting that you'll want to get creative with minifigures: they'll stay on well enough, but you may need to put in some effort to find a way to make them make sense, given the fact the wreath isn't oriented correctly for them. 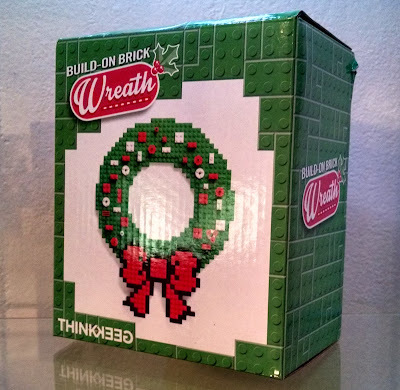 It's a fun product, but I'd recommend holding out for another sale, assuming ThinkGeek bothers restocking them.